The term Irish Republican Army (IRA) – or more rarely, Army of the Irish Republic – entered the modern political lexicon in the 1850s and ’60s with the establishment of the secret Irish Republican Brotherhood (IRB) in Ireland and the Fenian Brotherhood of America (FBA) in the United States. The military wings of the separate if fraternal revolutionary organisations both operated under the title of the IRA in the latter half of the 19th century. With the spectacular Fenian invasions of Canada between 1866 and 1871, the name entered global public consciousness, eliciting anger in Britain and inspiration among the colonised peoples of the British Empire. By the late 1800s and early 1900s the title had fallen out of fashion, until it was revived again during the 1916 Easter Rising. In that seminal insurrection the combined paramilitary forces of nationalism in Ireland, the majority Irish Volunteers and the minority Irish Citizen Army, Cumann na mBan, the Fianna Éireann and the Hibernian Rifles came together as the Army of the Irish Republic or Irish Republican Army. In the subsequent War of Independence, if the popular acronym IRA was not being used, there was a preference for English language terminology like the Army of the Republic or Republican Army. This was rarely given a direct translation into Irish, which used an alternative name for the insurgent force: Óglaigh na hÉireann or the “Volunteers of Ireland” (from the name of the original Irish Volunteers organisation, which continued to dominate the 1916-23 revolutionary movement following the Easter Rising). Subsequent iterations of the IRA have normally used Óglaigh na hÉireann (ÓnaÉ or ÓÉ) as their official title in the Irish language. Very few have opted for other names or indeed operated under untranslated Irish titles. Some notable exceptions were republican revolutionary groups (or pseudo-groupings) like Saor Uladh, Saor Éire, Arm na Saoirse and the contemporary Óglaigh na hÉireann. The latter has been militarily active in the British-administered north-east of Ireland since 2009, following its establishment by a core body of former volunteers with the 1969-2005 (Provisional) Irish Republican Army. A newly announced IRA group has claimed responsibility for a rocket reportedly discovered in the Poleglass area of Belfast following a telephone warning. 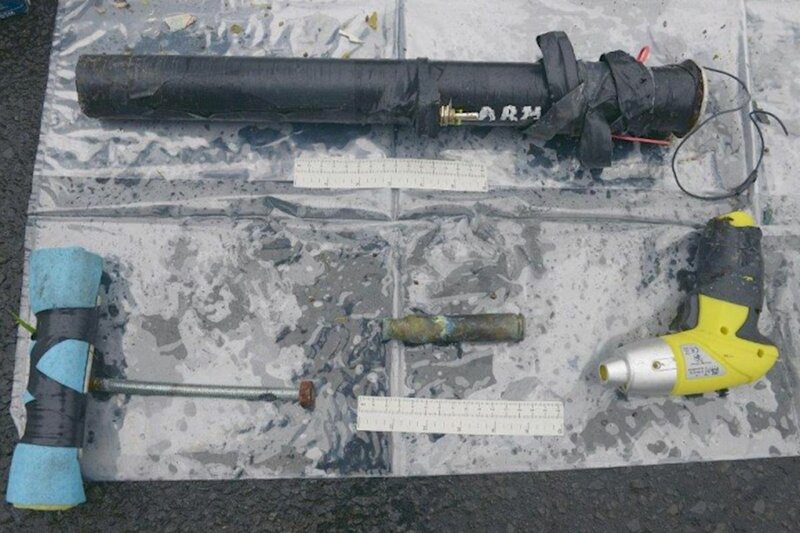 The PSNI police said they found a form of ‘explosively formed projectile’ (EFP), which was designed to penetrate armoured vehicles used by British state forces. An organisation which used the name ‘Arm na Poblachta’ [Irish for ‘Republican Army’] claimed responsibility for the device in a telephoned warning to news organisations on Monday. There were reports a PSNI helicopter had been in the area since last Saturday. Rumours of the existence of ‘Arm na Poblachta’ have circulated since at least August, but this is the first time a claim of responsibility has been issued in its name. Whatever its title, Arm na Poblachta will do no better than its contemporaries or rivals in ÓÉ, the Real/New IRA and the Continuity IRA to liberate the British Occupied Six Counties. The United Kingdom’s legacy colony on this island nation will not be extinguished through military action. At least not in the immediate future, and hopefully such methods will never be required again. Instead the template to follow is that provided by the very news source above. The campaign for reunification must be fought politically, culturally, socially and above all, informationally. Instead of Irish men and women going out to kill and wound British men and women (or in the case of the PSNI, the UK paramilitary police in the north, fellow Irish men and women) the resistance should be waged on the “battle fronts” mentioned above. Young republicans should be striving to advance their cause by themselves becoming intellectual weapons in the ongoing struggle. Parties and organisations should encourage and financially support their members in the fields of computer technology, social media, journalism, the law and politics. The fight does not require soldiers – it needs app-designers, journalists, lawyers and politicians. It needs a thousand non-combatant volunteers filling the ranks of our national press, radio and television networks. Where does one find progressive nationalist historians and writers, newspaper columnists and TV presenters in our public life? We should have a plethora of liberal, left-leaning republican media challenging the British, unionist and partitionist narrative on the internet and in print. Instead of founding new insurgent armies, republicans should be establishing online websites – like An Sionnach Fionn, like Irish Republican News – to articulate our political vision, our way forward for a reunited Ireland. One which does not require the pointless and counterproductive taking of human life at this stage in our island history, in however noble a cause. Why not reach out to the business lobby groups or form one like ‘Business For Scotland’. Irish Reunification should not be a left/right issue. I would consider myself liberal-right but the shameful treatment of northern catholics by the Free State makes me ashamed to be an Irish Citizen. Just because I don’t like Sinn Fein on every issue doesn’t mean we have to pander to a violent fearful excuse of human beings that is the PUL community. Frankly I’m done with reaching out and anyone that says otherwise can eff off. For a “micro group with no support” they are doing remarkably well. PSNI Irishmen? One doubts they even qualify as human, same as their southern counterparts.